Early alpha version available of my miniVNA software. Of course I mean in the miniVNA project!! I use no special component for drawing. Just TBitmap and double buffered painting. This way you get a flicker free screen. The communication with miniVNA runs in a separate thread so it won't block the user interface. Thank you for the nice MiniVNA program. Latest version works OK. 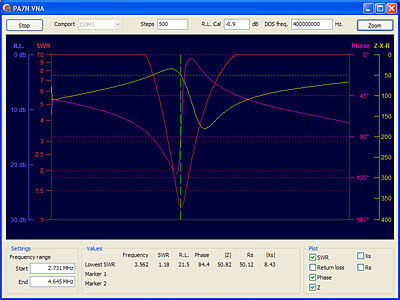 I like especially possibility to tune also under 100 KHz even though the levels are lower of course. Anyway I can check the resonance frequencies of LC-circuits on VLF-band 10 kHz-100 kHz also with these reduced levels. I measured following levels with W&G Level meter SPM-19 in to 50 Ohm load. For a first effort that software looks pretty darn good! I'd love to see your source code, and maybe even collaborate with you on the software!